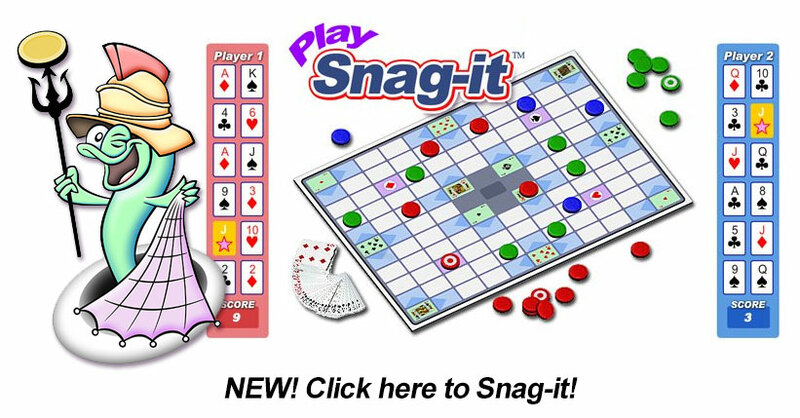 Snag-it is a board game for 2 to 4 players, using cards and tokens. Snag the most points to win! Players who use their Smarts and Strategy most effectively will Snag the most points. Deal each player 12 cards. Place the remaining deck face down in the center of the board. Play moves clockwise from the dealer. 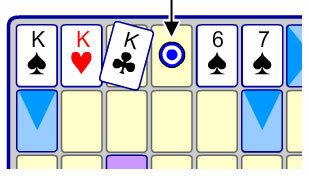 Plays are made by placing cards face up on different Spaces on the board. The first card in the game must be played on a Starter Space. All subsequent plays must either be on a Starter Space, or adjacent to a previously played card. A player who cannot play must draw a card from the deck. Players “Snag” Spaces by placing tokens on the board where they have scored points. The game ends the first time a player has played all their cards on the board. Play cards on Starter Spaces and/or Spaces adjacent to previously played cards. Cards of Equal Value AND Same Suit CANNOT be played next to each other. To play adjacent spaces, play a card of Equal Value in a Different Suit, OR a Sequential Value in the Same Suit. Aces are both high and low, and can be played next to other Aces, Kings or 2’s. 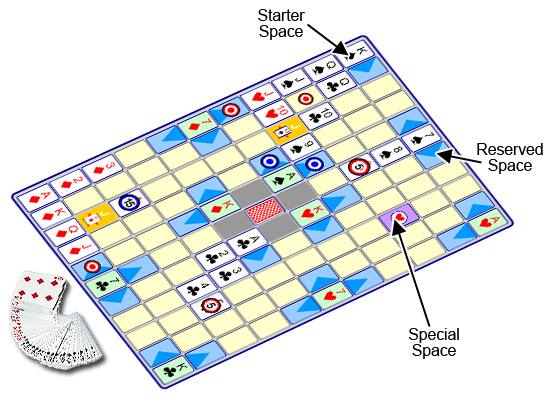 Reserved Spaces (adjacent to Starter Spaces) can only be played if a card has previously been played in an adjacent Starter Space. When you have one card left, you must declare "last card". The player who ends the game by playing all their cards first wins bonus points. When the game ends, all other players may play one last card from their hand, to reduce their un-played card penalty. If they cannot play a card, they do not have to draw a card. The winner is the player that accumulated the most points. To use a Joker, place it on the board and declare the Suit and Value. Examples: 3 of Clubs, King of Hearts. Jokers can be played as typical cards on Starter Spaces, or adjacent to previously played cards. Jokers CANNOT be played on Special Spaces. The Joker remains as that card Suit and Value while on the board. Jokers can be used to gain Snag-it points. If a Joker is on the board and you have the actual card that the Joker represents in your hand, you may use your turn to exchange the card in your hand for the Joker on the board. When it is your turn, take the Joker off the board and put it in your hand (where it reverts to a wildcard for later use) and place the actual card from your hand on the board where the Joker was, ending your turn. Players gain points by capturing un-played Spaces on the board so no other player can play any cards there. When a player captures a Space, they “Snag-it” by placing Tokens in the Spaces according to how many points the Space is worth. It is possible to snag multiple adjacent Spaces simultaneously. "King of Clubs" captures this Space next to a previously played card, earning 1 point for the Snag-it, since no future cards can go there and still satisfy the rules of adjacent placement. 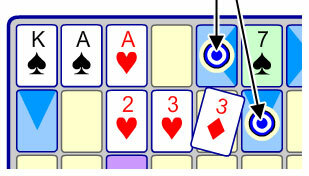 "3 of Diamonds" captures these Reserved Spaces, earning 2 points (1 for each Snag-it), since future cards can no longer go there and still satisfy the rules of adjacent placement. The Starter Space "7 of Spades" is unaffected and still playable. + 15 for each Turbo Snag-it: Ace, 7, or King of Same-Suit card on a Special Scoring Space. + 5 for each Super Snag-it: any other Same-Suit card on a Special Scoring Space. + 1 for each Classic Snag-It: any other Snag-it elsewhere on the board. + 5 for being the first player to get rid of all their cards. - 5 for each A, 7, K or Joker still in your hand when the game ends. - 1 each for any other cards still in your hand when the game ends.